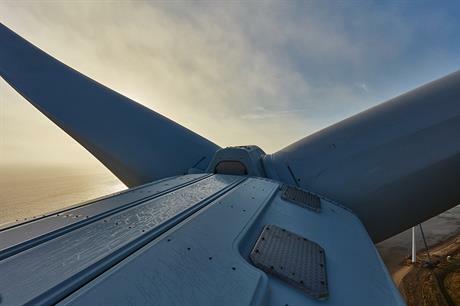 DENMARK: MHI Vestas will supply 49 V164 turbines to Vattenfall's Horns Rev 3 offshore project in Denmark that have been modified to output 8.3MW. The Danish offshore manufacturing joint venture was named as preferred supplier of the project in June 2015. Vattenfall was able to confirm the deal with MHI Vestas following its positive final investment decision in early June 2016. Horns Rev 3 had been developed as an 400MW project, which would have required 50 8MW turbines. But MHI Vestas' continued development of its flagship turbine means only 49 now need to be made to power a 406MW project. MHI Vestas will service the turbines for five years after installation, expected in 2018. In February 2015, Vattenfall won the license to develop Horns Rev 3 from the Danish government. Vattenfall placed a winning bid of €103.1/MWh to secure the contract from the government. At the time, it was a record low bid for an offshore wind project, but it was beaten this week by Dong Energy's €72.70/MWh winning bid in the Borssele tender in the Netherlands. Both prices exclude connection costs.